Africa's first World Cup reaches a fitting climax on Sunday when the two most impressive teams, the Netherlands and Spain, meet in what is expected to be a fascinating contest for soccer's biggest prize. The best games in a World Cup often come in the semi-finals but after a month of soccer of varied quality, these two teams are recognised as being the pick of the bunch technically, tactically and temperamentally. It is a final of firsts in addition to the location. Neither side has won the World Cup despite their undoubted quality, and Europe will win its first trophy on another continent. 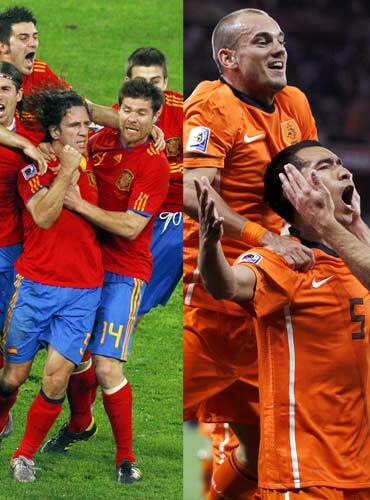 It is Spain's first final and a third for the Dutch, who were runners up in 1974 and 1978. Germany took third place on Saturday night after an exciting 3-2 victory over Uruguay in rain-swept Port Elizabeth which was far from the frequent anti-climax of the playoff game. A header from Sami Khedira won the game for Germany with only eight minutes to go after an evenly-matched contest. It was Germany's second successive third place in the World Cup. Both Spain and the Dutch perfectly illustrate the big lesson of this World Cup -- that the teams who play as units are superior to those that revolved around the fallen pre-tournament favourites like Cristiano Ronaldo and Wayne Rooney. The climax of a successful month-long tournament is also a triumph for South Africa who have confounded years of negative foreign reporting predicting it would be a disaster marred by violent crime, chaos and unfinished stadiums. President Jacob Zuma thanked the nation on Saturday, saying the hosting of the tournament had made them champions despite being the first host country to go out in the group stage. 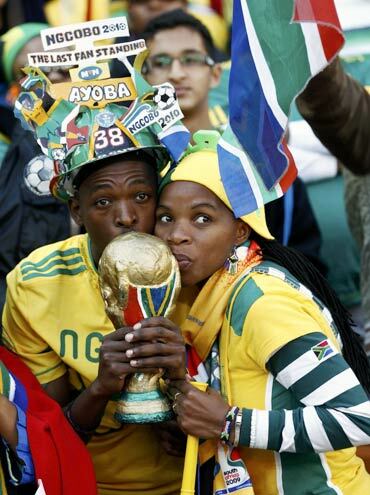 Zuma thanked his people for remaining passionate audiences despite the early elimination of their team, helping South Africa take third place in overall attendance at more than 3 million, behind the United States in 1994 and Germany in 2006. European champions Spain, who started slowly but peaked perfectly to eliminate a talented young German side in the semis, are favourites although they have stuttered in converting midfield skill into goal-mouth punch. They are the popular choice of many, from kids kicking a ball around in the township of Soweto to the world's press who made them overwhelming favourites according to an online poll by the International Sports Press Association. But the Netherlands will be tough to beat, with a powerful trio of Dirk Kuyt, Wesley Sneijder and Arjen Robben to combat Xavi and Andres Iniesta leading Spain's masterful midfield. The Dutch, despite disappointing their fans with a more defensive approach than the teams of the past, have won all their 14 World Cup games including qualifiers. Spain tormented the Germans and others with their talent for holding the ball and precise passing even under pressure, but have lacked the killer instinct in front of the net with only seven goals from six matches. Even coach Vicente del Bosque says they are not clinical enough. Striker Fernando Torres, recently returned from surgery, has yet to score and they have relied heavily on their ruthless hitman David Villa, the tournament's joint top scorer with Sneijder, Uruguay's Diego Forlan and Germany's Thomas Mueller on five goals each. The Dutch, considered the best team never to have taken the trophy, have been more prolific with 12, but have also seemed to lack the killer instinct at crucial moments. Spain's fans will be led at the final by Queen Sofia while the Dutch are backed by outgoing Prime Minister Jan Peter Balkenende, among an array of VIPs including 14 African presidents, a king, a prince and an emir. But the big question, especially for South Africans, will be whether Nelson Mandela, the beloved father of the post-apartheid nation, will attend. Mandela missed the opening ceremony on June 11 after his great grand-daughter died in a car accident the night before. He is in frail health at the age of 91 and his office rarely gives details of his movements in advance. If he does attend, it will be seen as the perfect way to cap huge national pride over a successful tournament which has boosted not only this country but the whole of Africa. Experts and officials say it has rebranded South Africa, boosting racial reconciliation and national unity in a country still troubled by divisions 16 years after the end of apartheid. Fund managers say the impressive way in which the tournament has been run has already attracted new business and capital into the continent, which is seen as a growing frontier market.